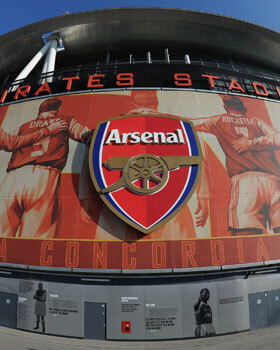 Please contact Emirates Stadium Tour and Museum directly to redeem your ticket using your iVenture Card. Closed Days Tours not available match days or during events. Please check updated closures over match days and public holidays. Children under 16 must be accompanied by an adult. While this is a dream destination for every Arsenal supporter, even if you’re not a fan, this is one goal you’ll want to put in the back of the net - a behind-the-scenes, VIP tour of one of the largest football stadiums in London and one of the most famous in the world – The Emirates. The nearest tube station is Holloway Road (Piccadilly Line). You’ll be entering the stadium from the Armoury Store area on Queensland Road. From here, you’ll step out into the light of the one of the most impressive sporting arenas on the planet. Close your eyes and imagine the atmosphere on game day with 60,000 supporters filling the stands and the air with their voices. p>This tour really does have it all. From the changing rooms, you can experience the walk down the player’s tunnel and sit in the dugout, before carrying yourself off to the physio room to see where players get prepared before the game. You can even grab a glimpse inside Arsene Wenger’s office where he does his pre-game prep - if he isn’t arranging his next signing, of course. And because it’s a self-guided audio tour, you can take your time, experiencing all the backstage thrills of the big game first-hand. But that’s not all! Your ticket also provides free entry to the Arsenal museum! Open 10.15am to 6.30pm, and until 4.15pm Sundays, tours are available seven days per week, except of course on match days. This tour is often fully booked, so arrange your tickets well in advance if you want to guarantee availability on a specific day. The Emirates is popular with football fanatics from all over the world, so it’s a good idea to get there early to avoid the queues and take full advantage of all the sights on offer. While this is a self-guided tour, there are staff available at various points who will be happy to answer any questions you have. Be aware that, due to pitch events held at the end of the season, some areas of the stadium are inaccessible in May.